This entry was tagged ASD, asperger's, autism, flapping, stereotypies, stimming, survey. Bookmark the permalink. This is SUCH A GOOD IDEA! Again, when I was first introduced to the idea of stimming, I didn’t think I stimmed. Now, I don’t know how I managed to not notice I was stimming! I tiptoe basically all the time, I pace around on my toes a lot (especially to music), I sing/hum/etc to myself (usually the same few lines over and over again), I lock my hands together and flick one middle finger against the other palm, I flap my hands sometimes, I sort of claw at my neck when I’m nervous, the list goes on! I default to the happy stims too! I guess it could be through wanting to show that stims can be a good thing? I’m still adding things as well! “Oh yes that too… and that… and oh that one!” So please, feel free to add anything you can think of! I’m feeling a bit stunned as well! I even dreamed about stimming last night. There’s so many things that I’m not even conscious of. Such a great idea! I really do believe that increased understanding of and exposure to stims will lead to increased acceptance. As you mentioned, a lot of neurotypical people reading this list will find something of themselves in it too-I’ve known lots of people who tap their feet or drum their fingers. It’s one of those ways in which we’re more alike than we realize. Thanks! It’s true that autistic people are far more involved in their stimming and do it more often, but I think that’s more a sign of how much trouble they have regulating sensory input. The stimming itself isn’t “abnormal” behaviour! We’re only different in our sensory processing. Saying that, although I sometimes wish I had better capabilities in coping with overwhelming sensory stuff, I wouldn’t want to become numb to the joys either. Like how GOOOOD things can smell, like flowers or the air after rain or PIE! And how visually stunning RAINBOWS are! What an awesome list! It’s amazing how varied our stims are. I stim in a lot of ways, but th most noticeable is twirling my hair. I remember the psychologist who diagnosed me with autism said this was the second most important thing to unlearn, after meltdowns. I bet he’s clueless about how many NTs stim. Case in point, I ws once at a college tour seeing if I liked particular program, and the students were roleplaying a scenario commonly encountered in the field the program was about. First, the students did it the “right” way and hten the “worng” way (ie. unempathetic comments etc.). I noticed that at the “right’ roleplay, the student modeling appropriate behavior was constantly clicking his ballpen. That’s stimming too and it wasn’t part of the act. Unlearn? Oh man. That implies it’s a learned behaviour to begin with. I don’t think anyone showed me how to flap my knees when I was a child. Really. I know so many people who constantly click or tap their pens. Stimming is in the eye of the beholder! I put in a few of mine. This is a great idea! Thanks! I just love reading the ever expanding list. There’s so many awesome ones! But also “socially inappropriate” ones which I think are really important as well. So many possible ways to categorize things! Lists lists lists lists lists. I love lists. Shoot. My comment must’ve accidentally selected most of my text. That would be really great! I’m still not sure how to present the results in a format that will be both interesting and easy to read and informative. Plus I might have to do something with a database so people can keep adding to the list. Thoughts thoughts thoughts! One thing that comes to mind is a word cloud. That could represent the relative frequency of particular words such as “tap”, “hands” or “flap”. I’ve also seen graphs that represent collocation: words that are used in conjunction with one another. 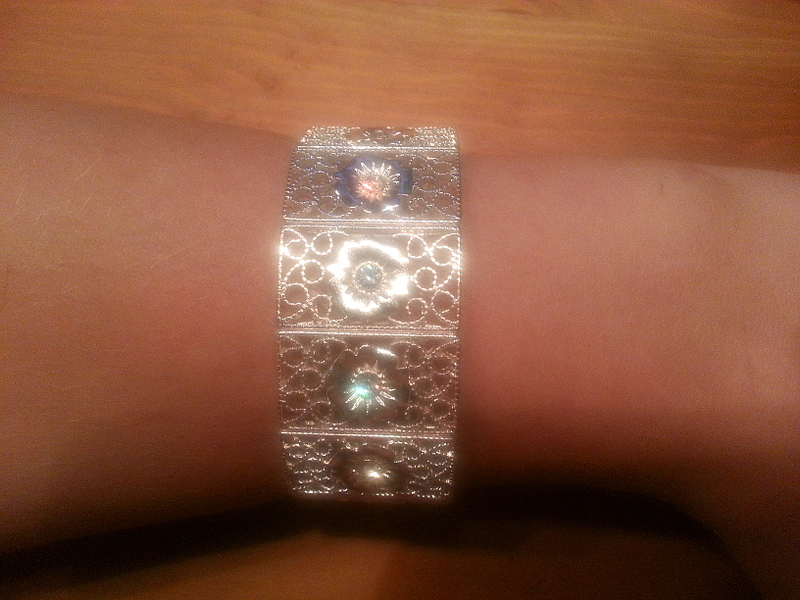 Oh, I wanted to share because on Aspermama’s blog today I mentioned having bought a shiny silver bracelet just because it was SHINY and I can stim with it. Also, this makes me so happy, because tons of people do the same weird stuff I do, too! Family! I know! I love going through the list looking for things I recognise. I just have to use the same color and type of clothespins for drying my clothes. Does that count as stimming? And to make it worse – my wife has bought several different kinds and colors, ON PURPOSE. And! she switches them every now and then, just to see me ordering them again. Now that I think of it, a lot of OCD behaviours are probably a form of stim as well. Definitely self-regulating. So I don’t know why I made that distinction. I’m still learning something new every day, so if you see me making a mistake, please call me out on it! this is a question i’ve never been able to answer. i will definitely take this survey, curious to see the results, thx so much for putting this all together. i was diagnosed as asperger’s…now autism spectrum disorder…without having any stims that i was aware of. i’ve never been able to identify anything specific…most of my spectrum traits were related to difficulties with social processing, and some sensory issues…stimming was always something i never understood, and when reading about it, had the same experience you had, basically discovering it was controversial (although i’m firmly in favor of the belief that it is natural, beneficial)…but not stimming myself, it’s not an issue i’ve studied further. so, i’ll take this, we’ll see what happens. thx again, great post. I think it might be because the mental health professionals pathologise it so heavily, always looking to see if behaviours pose a problem (a friend of mine had an occupational therapist say about her son, “Well, at least he’s not like THAT”, meaning banging his head and chewing on everything in sight). It has to be visibly and notably “different” to be called stimming, and they always mean it in a negative, “this is why you’re excluded from society” sort of way. Well, of course I don’t do any stimming then. If I did, someone would have said something. Nobody has ever excluded me for things like that. And then you start reading blogs by other autistic adults and you come across other types of stims and you think to yourself “hey wait a minute…” and it’s none of it negative, it’s just a part of who you are. And the list gets longer and longer. And that’s why I wanted to include all types of stims here, even the things that nobody thinks are “all that bad”, like tapping your foot. That’s the point. It’s normal human behaviour. The only difference, if you will, is that stimming in autistic people is often a bit more frequent and/or intense, and it’s harder for the autistic person to stop doing it, because they need the sensory regulation so badly. But the difference is not in the stim itself. I think everyone will recognise some of the things on the list. Autism Jabberwocky recently wrote a very good post on stimming. I found the article you mentioned and I’m going to address it here first, if you don’t mind. First of all, I do like the writer’s summary of possible causes and possible results. It’s a very concise and clear overview of the kind of behaviours we’re dealing with. It also gives a good starting point for dealing with behaviours that are potentially harmful to the person or to the people around them. What I don’t agree with is the assumption that people who speak out against the idea of stimming being intrinsically harmful must be high-functioning. The people who are making statements like these presumably have a diagnosis of autism and know how their personal stims affect their daily lives. I might think that they take an extremely shallow view of stimming and what it is like for people who aren’t quite so high functioning but I don’t like to nitpick what people with a disability say about their disability. Especially since a lack of understanding of what others are thinking or experiencing is a large part of the disorder that they are struggling with. OK, let’s tackle that last sentence first. Saying that I don’t understand what stimming can be like for others BECAUSE OF MY AUTISM is something incredibly hurtful to say. It discounts my perspective and my experiences and any advice I might give based on those things, before I’ve even opened my mouth. Because I’m too autistic to understand others. But I’m also too high-functioning to know that stimming can cause harm? There’s no way for me to get heard here. What I also don’t agree with is the assumption that some stims intrinsically interfere with the person’s ability to function or learn. He gives the example of a child who “has to constantly move about the room and scream” and claims that this interferes with their ability to function in the classroom. I disagree. Constantly moving and screaming upsets the teacher, it upsets the other children, so on that basis you can try and redirect it, BUT IT DOES NOT HARM OR DISTRACT THE PERSON THEMSELVES. There is absolutely zero proof of that. All the proof points to the exact opposite, that by not having to spend energy and processing power trying to SUPPRESS the stim (which is far more distracting and anxiety inducing than indulging in stimming), autistic people are able to concentrate and learn a lot better. I also don’t like the overall sarcasm. The language he uses is very condescending. “So hyperbolic that it would be funny if it weren’t so sad”. “Mean parents like myself”. Oh wait, I’m autistic, so I’m not supposed to understand sarcasm. (That’s a sarcastic sentence). Oops! My bad! (That’s a sarcastic exclamation). Finally, what bothers me the most is that he doesn’t pay any attention to the notion that suppressing RELATIVELY harmless stims like “push on their chins with the palm of their hands” may actually LEAD to more intense stims like “slamming their palm into their chin” because the person is prevented from self-regulating when whatever’s bothering them is still at a manageable level. THIS is what most autistic advocates are trying to address. Let us fiddle with our hair, don’t tell us to sit still or stop bouncing, don’t imply that our hums and flaps are what makes the other kids bully us, allow us to fidget at the dinner table if that is what enables us to actually EAT our dinner. Because having to suppress all those things INCREASES the sensory overload or anxiety or craving of sensations that we’re trying to deal with. He doesn’t address that at all, which might give parents and caretakers the idea that they’re helping us when they teach us how to “manage” stims and how to not let those stims “control” us. It’s not helping at all. He’s right to mention that not every stim is harmless (in fact, there are a few on the list that can be characterised as self-injurious), but by the way he’s talking about it, he’s the only one saying truly harmful things here. Since I wrote the post you are commenting on I would make a few responses, if I may. First, the point of the statement about lack of understanding other people’s point of view was not meant to be a hurtful one but rather one that reflected what actually happens. And, at the risk of offending again, your responses to my examples are exactly what I am talking about. The thing that I didn’t’ explicitly say in the post but I thought was implied was that the most of the examples I used are actually things that my daughters do. So the screaming and running in class, that’s my youngest. So these statements – “BUT IT DOES NOT HARM OR DISTRACT THE PERSON THEMSELVES. There is absolutely zero proof of that.” are just wrong. I have seen this exact behavior in my child. I have, along with my wife, a special education teacher, an aide, and a BSC taken the time to look at the behavior, the situation around it, what triggers the behavior, and what the impact on her is. Even though my daughter can’t articulate why she is doing what she is doing I think we have a pretty good idea of what exactly it does for her and why she is doing it. So the short answer is yes, it does prevent her from learning. The “proof” is the combined opinion of five people who are all highly qualified to make a judgement on the actions of this particular child with autism. And yet you obviously think that analysis is wrong and that you know better? I would be interested in understanding exactly why you think I am wrong. Second, I don’t believe that I said anything about people with autism not understanding sarcasm. And yes, I am sarcastic, but having been called far worse than a “mean parent” many, many times, I think I am entitled to the sarcasm. Third, and maybe I didn’t say this explicitly, I don’t think suppressing “relatively” harmless stims is a good idea. We certainly don’t as long the stim isn’t something that needs to be addressed per the other ideas in my post. But here again, and this is me possibly offending again, the idea that pushing on the chin is relatively harmless is wrong and again the reason is in the details. As I said in the post, the pushing on the chins is a stress reaction that can quickly escalate in slamming the palm in the chin. Behaviors that lead to SIBs are never even relatively harmless and need to be stopped. In this case we redirect the behavior and try to give them other outlets to deal with stress that don’t involve hurting themselves. And yet again you seem to think that you know better and call out the behavior as “relatively harmless” and say that we are wrong to suppress the stim. How can you possibly know whether the particular stim is relatively harmless without knowing anything about the people who have the stim or understanding the cause of the stim? You’ve got a good point here. No one can know the potential harm without information about the person stimming or the cause of the stim. But I really don’t think autisticook was trying to claim that your daughters’ stims are harmless. She was not addressing you directly, she was explaining why she does not feel your article to be a good overall look at stimming. And despite your insistence that we do not understand the cause of your children’s stimming (and of course we don’t know your children, so no, we can’t know those causes and don’t claim to), there is a glaring omission of addressing causality in both your article and your comment here. I’m willing to bet you are a fantastic parent and you know exactly what causes your children to stim and I’m willing to bet you do anything you possibly can to make their lives better, easier, and more fulfilling. I can’t accuse you of being a “mean parent” because I honestly doubt that you are one, but let me at least warn you that when you omit this information it triggers a reaction in this community. We cannot help but worry that your children aren’t getting help for whatever is at the root of their stim instead of just getting it redirected over and over and over until they hit on a “relatively harmless” behavior that may not be adequate to satisfy their needs. Like I said, none of us have reason to believe you are a horrible parent who doesn’t want or try to help your children. But we (and maybe I don’t speak for all of us but I certainly speak for some) would appreciate a little empathy on your end, too, as well try to explain what our experiences are like and wonder if you can’t learn something from us the same way we can learn something from you. Please allow me to clarify, I am not implying a lack of empathy. Empathy involves a lot of things besides just an understanding another person’s thoughts or perspective. What I am talking about is what seems to be a built-in presumption that when you see a similar situation that you might not recognize that it is in fact quite different than expected. To put that a different way, there seems to be a built in bias to pay more attention to the bits that are as expected and a tendency to overlook things that aren’t. So go back to Autisticook’s comment when she said that there is no proof that running around the classroom and screaming distracts or harms the person who is stimming. She was presumably looking to her own experiences and what she knows about stimming. But she also, again presumably, overlooked that the example was predicated on a real life situation that does not mirror her own thoughts on the matter. The categorical “absolutely zero proof of that” hints at her missing the possibility that things might not be as expected. But I wasn’t sure I was reading that right which was why I asked what for clarification on whether we were in fact disagreeing. I do have one question for you though. You said that I didn’t address causality, i.e. why the stimming occurs. I thought I listed five different things that I thought were common causes and acknowledged that there were other reasons. What bit of causality do you think that I did not include? Just a quick note to say that I use “zero proof” to mean that there is no scientific evidence that says that stereotypies or repetitive behaviours cause the person to be distracted, instead of being a physical response to the person already feeling distracted, or even not causally connected at all. If you know of a peer reviewed article in a publication with a high academic Impact Factor and a basis in neuroscience, then I’d really and honestly appreciate it! That is a rather interesting standard of proof for a question that is unlikely to have ever been researched. How easily can you scientifically prove that anything caused any person to be distracted in an uncontrolled environment in a generalized way? In children with autism who have an extremely wide range of responses to everyday situations it would be almost impossible to reach this standard with any behavior, especially if the child was only minimally verbal. How would you even measure if the child was distracted at all to start with when the conventional measures of attention don’t typically work? Which is why you fall back on a subjective analysis that is based on their individual situation by people who know the individual well. But that sort of analysis would never get published except as possibly as a case study.